Both the new Samsung Galaxy S7 and S7 Edge are advertised as water resistant, but they aren't waterproof, as a 30-minute dunk test proved. SquareTrade Labs tested both phones in a Deep Water DunkBot and found that both mostly survived after 30 minutes under five feet of water, but their audio was left permanently muffled and distorted as a result. SquareTrade, which sells smartphone warranty plans, posted a video of its testing. In it, the company notes that Samsung's claim is that both phones are "water resistant in up to five feet of water for up to 30 minutes" (emphasis added). As with most things technical, the testing is not without controversy. Samsung's most recent online claim is not water resistance in up to five feet of water, as SquareTrade tested, and instead is less, for up to 30 minutes in 1 meter of water -- or about three feet, 3 inches' worth. 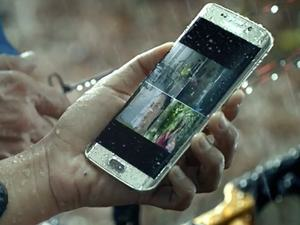 SquareTrade was apparently relying on some claims made by Samsung partners that used the five-foot water depth. Verizon, for example, has the two Samsung phones as being "water resistant in up to 5 feet of water for up to 30 minutes" in its product footnotes. Samsung itself rates the water-resistance feature at IP68, which is an industry term for the International Protection code (sometimes termed the Ingress Protection mark). The "6" in the code means it is "dust tight" while the "8" means the device is suitable for continuous immersion beyond 1 meter under conditions specified by the manufacturer. However a smartphone user regards the Square Trade test, it is obvious the lab wants to compare similar smartphones and not provide anybody with a legal defense against Samsung's claims. The lab found that Apple's latest devices fared worse than Samsung's new devices in the dunk test, as expected, since they are not advertised as water resistant. The iPhone 6S lost all audio in the lab's 30-minute water dunk test and suffered water damage under the screen. The larger iPhone 6S Plus began malfunctioning at 10 minutes under water and was rendered a brick at 24 minutes, according to SquareTrade. However, SquareTrade did find the iPhone 6S survived its 30-second TumbleBot test nearly unscathed, while the S7 and S7 Edge suffered significant damage to their back panels. The iPhone 6S Plus's screen was completely shattered. The TumbleBot rotates at 50 revolutions per minute, continually dropping a device inside a drum. When dropped on their corners from six feet high, the S7 cracked after four falls, while the S7 Edge was rendered unusable after seven drops. Facedown drops proved worse, with the S7 shattered on the first fall, and the S7 Edge shattered on the second. When put under bending pressure, the S7 Edge cracked at 110 pounds of pressure. Both the S7 and iPhone 6S withstood 160 pounds of pressure. SquareTrade also assigns new smartphones a "breakability score" from 1 to 10, with 10 being the highest risk of breaking due to an accident. For both Samsung phones and the latest iPhones, all four are listed at "medium risk" of breaking due to an accident. Numerically, the iPhone 6S has the lowest risk, at 4, while the Galaxy S7 came in at 5. Next higher, the S7 Edge came in at 6 and the iPhone 6S Plus came in at the highest risk of breaking due to an accent, at 6.5. In an in-depth review for Computerworld, Dan Rosenbaum dropped the Edge in a sink of water for a minute or two, and found it did fine.